It will not be certain until the very last moment whether Serbia will get a date to begin accession negotiations with the Union at the EU summit on June 28-29. Currently, Belgrade is a hot destination for diplomats from all over the EU. In the past few weeks, the Serbian capital city was visited by the foreign minsters of Germany, UK and this week began with a visit by Austria's minister of justice. The main purpose of the diplomatic shuttles is the member states to get as much precise information as possible about whether Serbia will pay back the trust it will be granted in June or will it, after receiving the date, continue working on its own agenda. There is no doubt that the decision of the member states will be very hard. The decision will be difficult because the signals that Belgrade sends are in a sense contradictory. Prime Minister Ivica Dacic seems absolutely determined and does not cease repeating that starting accession negotiations with EU is vital for Serbia. He is aware that the pre-condition for that is to ensure that the Brussels agreement from April 19th will be implemented and that Serbia can no longer wait. The influential first deputy prime minister and right hand of President Nikolic, Alexander Vucic, is also convinced that Serbia's European path is the only right one. Moreover, during his meetings with diplomats from the member states, he says that for Serbia it is not only a matter of starting negotiations, but also of receiving economic boost. Both the prime minister and his first deputy are obviously well accepted and trusted by European diplomats. It is no accident that Dacic was called by a MEP "Richard Nixon of the Balkans". According to the Serbian office of the Deutsche Welle, Germany's Foreign Minister Guido Westerwelle accepts Mr Vucic very well, unlike President Nikolic. The reason is that Vucic's approach is strongly pragmatic which was quite visible during his first official visit in Zagreb when he came to contribute for the improvement of the Serb-Croat relations which went through a very fast cooling last year. During his visit in Belgrade in the end of May, Westerwelle met President Nikolic, from whom, however, he did not hear very welcoming words. For instance, he heard that Serbia did not want to be "blackmailed" or "tempted" and that it had already achieved everything it was required to. 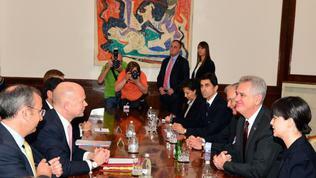 Almost the same words heard British Foreign Secretary William Hague, too, who was in Belgrade and Zagreb last week. Mr Nikolic told UK's top diplomat that Serbia had achieved a lot in the past year and "has a full right to expect a date to start negotiations with EU". 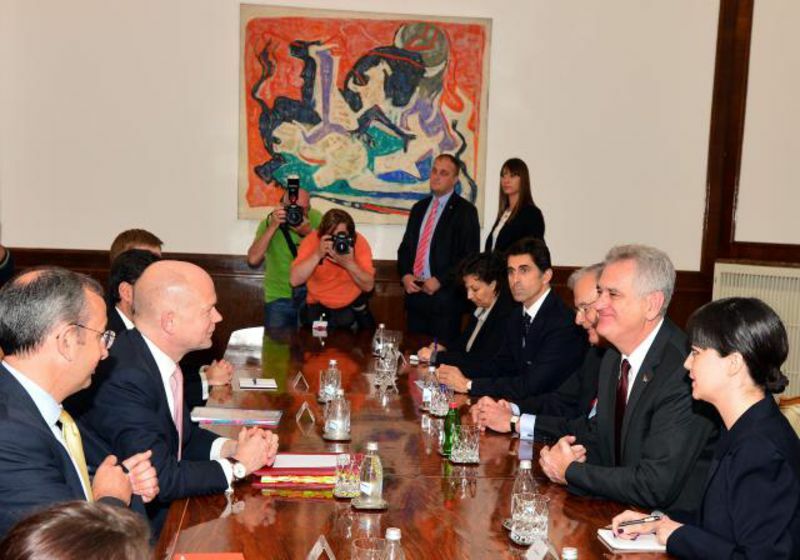 After his visit in Belgrade, Hague pointed out that UK continued to be a strong supporter of EU's enlargement for all Western Balkan countries. In his words, Serbia had indeed achieved a lot in the past months in terms of normalising relations with Kosovo and in terms of EU accession criteria. However, the member states still need to be convinced that Serbia will stick to the agreement with Kosovo and that it will implement it, which seems a difficult task. To the euinside's question whether it can be expected Serbia to get a date in June, William Hague did not sound as enthusiastic as the press release from his visit in Belgrade. He said that getting a date depends on the progress made. The stakes are in the upcoming weeks when it has to be ensured that all member states will acknowledge that progress. He recalled that the decisions in the Council were taken unanimously, meaning that, indeed, all countries must be satisfied with Serbia's progress. William Hague was very cautious in his assessments and preferred more general wording. He hoped that the outlook for enlargement will remain strong and "very positive" at the June Council. The question, though, is whom should the Council trust - President Nikolic when he says that Serbia is determined to solve the issue with Kosovo and that it will stick to the implementation plan, but that Serbia will never implement anything that is not included in the agreement from April 19th, nor will Serbia ever recognise Kosovo's independence. And for Serbia it is important to get a date and "for this purpose Serbia will not mislead its European partners by promising them something it cannot do". Moreover, Serbia does not want to be on European allowance, but it wants to work, said Nikolic. Or should they trust the Dacic-Vucic tandem? In fact, the choice is not that difficult and it seems that Brussels has again found the magic formula. According to an article in the Serbian daily Danas, quoting Milan Pajevic, director of the office for European integration, in June the leaders will not recommend a specific date, but rather they will empower the Commission to start the negotiations when all the conditions are fulfilled the main of which is implementing the Kosovo agreement. Such a solution would be a really successful attempt to keep the eggs unbroken and in the same time make an omelette. Brussels and the 27 capitals should be completely aware that if Serbia is left waiting outside, this could have severe consequences for the region. Serbia, indeed, achieved a lot and made many sacrifices to earn Brussels's trust. All this can be wiped out in just weeks if EU does not encourage in an appropriate manner these efforts. There are fears here in Zagreb, which on July 1st will become the 28th EU capital. According to diplomats euinside spoke to, not in all member states and even in Brussels there was awareness what the stakes are and what can happen with Serbia and the region if the June summit does not send a very clear signal. Macedonia is a very good example, Zagreb believes, because in 2010 when the former Yugoslav republic did not get a date, it was much better prepared, while today it is not only not prepared, but the situation in the country is deteriorating by the day. And Macedonia is small. It is not hard to predict what could happen in Serbia if it does not begin negotiations as soon as possible, especially given the fact that the government finds it really hard to convince the more radical part of society that this sacrifice is worth the effort. Around the negotiations with Kosovo with the mediation of Lady Ashton earlier this year, Premier Ivica Dacic said that unless Serbia chose the European path, the alternative was to turn into a European North Korea. So, the ticking in the Balkans will only be getting louder. Depending on what the leaders will decide, it will become clear whether it is just a clock ticking or a clockwork.